Keeping your food cold is a concern whenever traveling with perishable items, but it becomes much more of an endeavor on multi-day outings. Even a well insulated cooler such as a Coleman XTreme will not be able to stay cold more than 3 or 4 days assuming normal use and a good amount of the available space is taken up by ice. There are a couple of strategies you can employ to was less space and to make the ice last longer, but ultimately you'll wind up with soggy and warm food at some point. Recently I got an EdgeStar FP430 refrigerator which runs on 120VAC or 12VDC and uses freon and a compressor to cool the interior. This type of fridge is much more efficient than a thermoelectric portable cooler and is well insulated to increase efficiency. There are more expensive options from ARB, Norcold, and Engel but the EdgeStar represents a good compromise between price and performance. Detailed reviews of this unit can be found at expeditionportal.com, ih8mud.com, and many other expedition and offroading related websites. 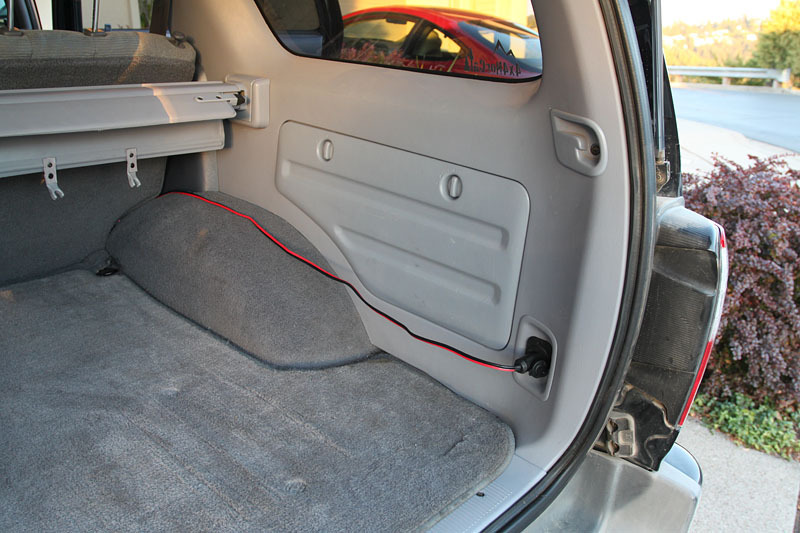 My goal for this article is to specifically discuss usage and installation in a 3rd generation Toyota 4Runner. As an initial performance test I plugged the EdgeStar into the 4Runner and let it run until the low voltage shut off kicked in. The starting fridge temperature was ~70F and the thermostat was set to 38F. A large amount of soft drink cans were placed inside the fridge to simulate a standard load's thermal characteristics. Just testing with air will not give valid results since air has very poor heat retention and makes the fridge less efficient. Day 2 9am (12 hours) : Fridge temp = 38F. Day 2 9pm (24 hours) : Fridge temp = 40F. Low battery warning light on. Day 3 9am (35 hours) : Fridge temp = 50F. Low battery warning light on. Based on the above it appears that I can get a solid 24 hour run time assuming the external temperature is not too high and I don't open the fridge too much. For trips I'll be pre-cooling the contents on 120VAC which will extend the run time. The battery measured 11.5v after 36 hours and the truck started immediately. It's a bit strange that the fridge hit its low power since based on my measurements the voltage didn't drop below 11v. Rated current draw is 5.4A @ 12VDC, and I would guess the duty cycle in my test was under 50% leading to an average draw of < 2.7A per hour. Interestingly my battery is rated at 68Ah which would only allow a maximum of 25 hours run time at 2.7A, so I'm guessing the duty cycle was much less than 50% during my test. 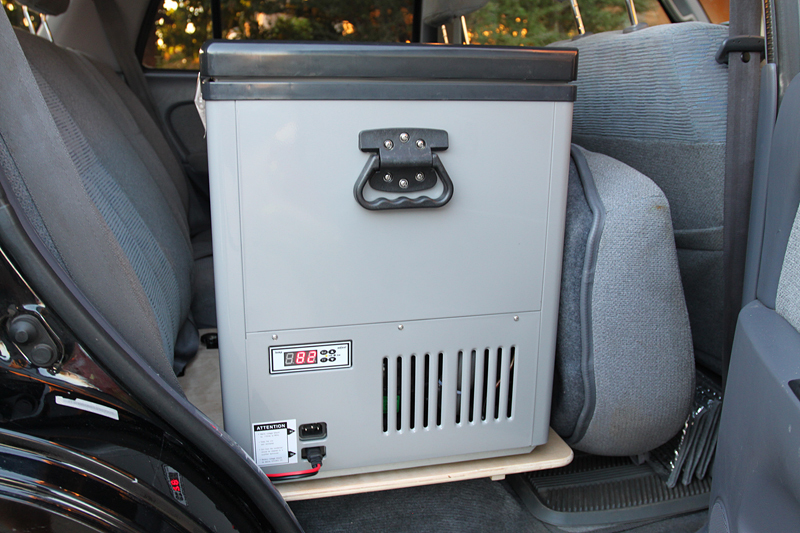 There are basically two installation locations for the fridge in the 4Runner, the back seat and the trunk. The trunk has the benefit that all the seats are still usable, but it requires either stacking a bunch of stuff on the fridge or building a raised drawer platform to mount the fridge on. The downside of the trunk is that the fridge is not accessible from the front seats while driving. I decided that wherever the fridge was mounted I wanted to be able to open the lid completely and remove the wire baskets for loading. This is possible if it is sitting on the floor of the trunk, but if mounted on a drawer platform I would then need to build a fridge slide. 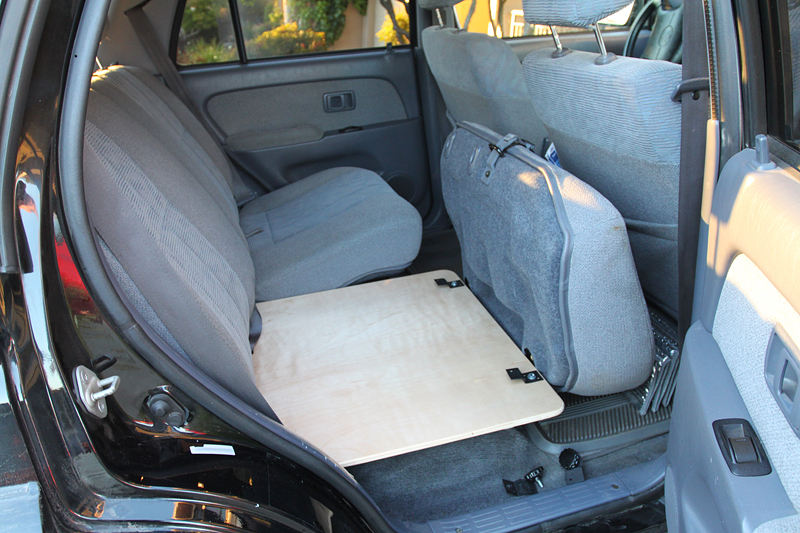 When sitting on the rear seat cushion the lid cannot be raised all the way. 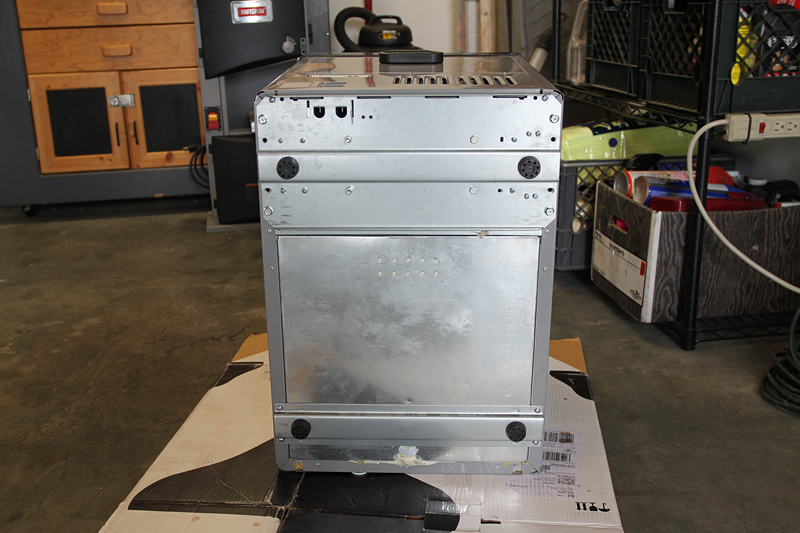 Ultimately I decided to flip a rear seat bottom forward and mount the fridge to the seat rest. In this position the top can be opened completely, it is reachable from the front seats, and the power cord reaches the rear outlet. The following pictures show the details. 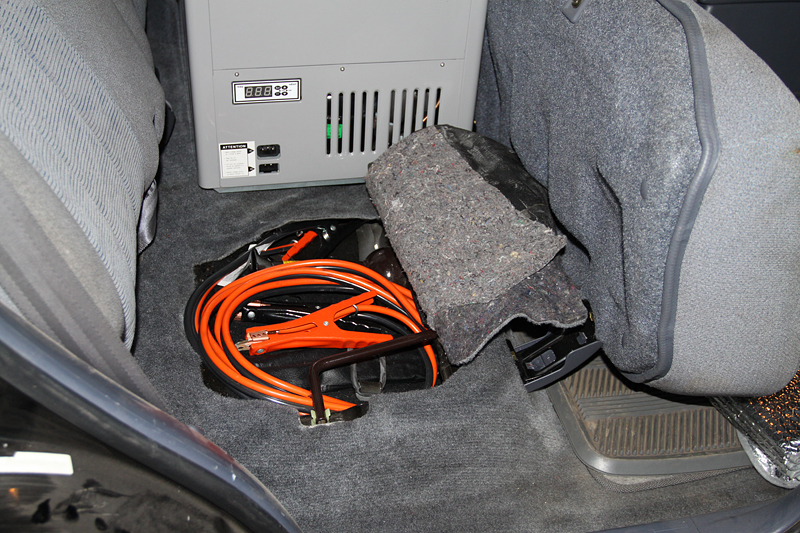 I store my jumper cables under the rear seat along with the factory jack. 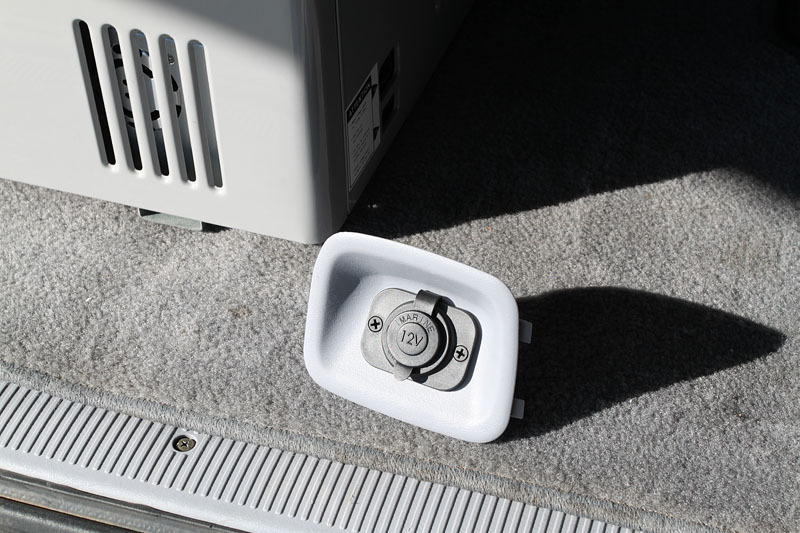 The jack handle is mounted on clips that raise up above the sheet metal so the fridge must be elevated so it doesn't rest on these clips. The bottom of the fridge has two hollow rails that support the feet. I used these as mounting points. One serious problem people run into is that the power cord can easily pull out of the power outlet, which you may not notice until hours later. 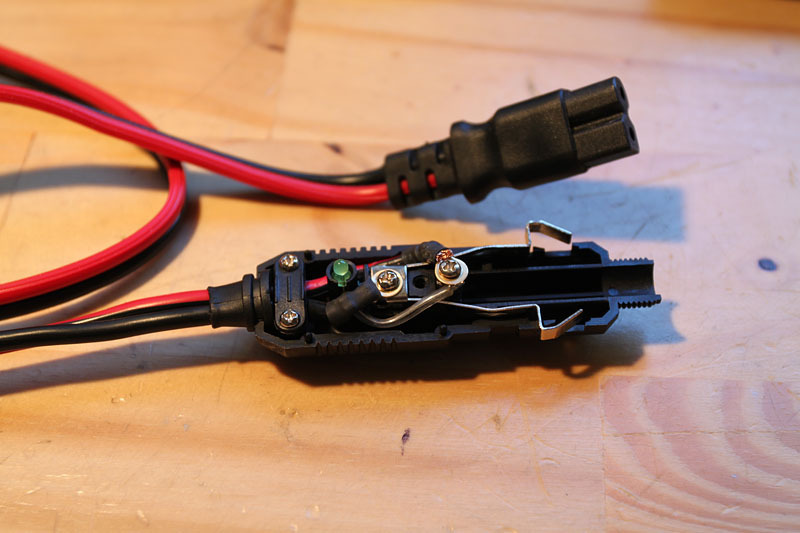 I upgraded mine with a lockable marine unit from Digi-Key. 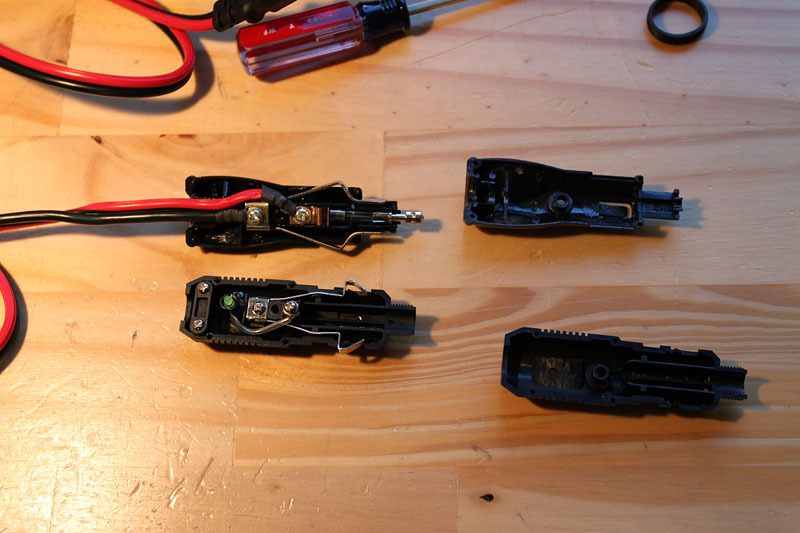 Luckily the new plug's mounting screws are very similar to the stock part so the wires do not need to be modified. The new plug comes with a 3A fuse which may not be enough to handle the fridge's maximum current draw. The EdgeStar plug had a 10A fuse and I might need to upgrade at some point. 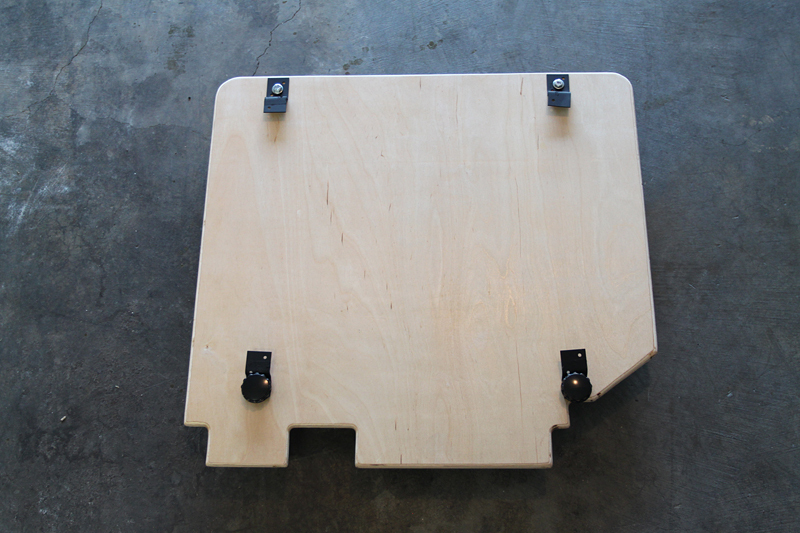 I made a mounting plate out of some ~8 layer 1/2" plywood from OSH which is reasonably lightweight and very strong. 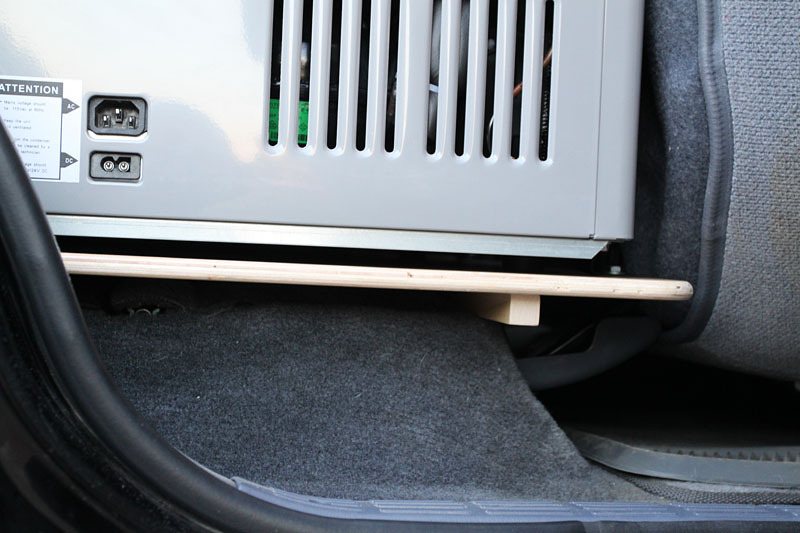 One side is cut to fit under the rear seat which clamps everything in place once the fridge is mounted to provide safety in case of a roll over. The brackets are made out of angle iron, and one set is removable so the fridge can be slide in and out of the mount. I applied 2 coats of a clear poly coat to keep the plywood protected. 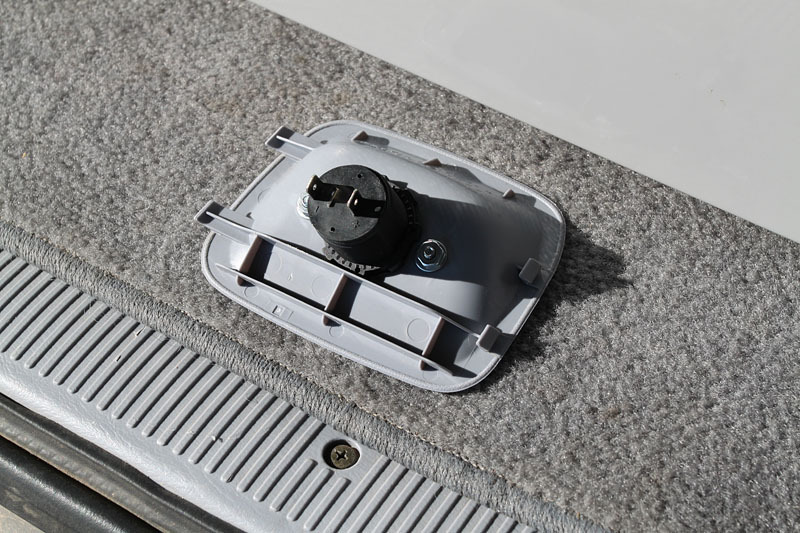 On the bottom there are 4 t-nuts for the bolts, and a foot at the front to rest on the sheet metal and elevate the plywood above the jack handle mounting clips. Here you can see the mounting plate in the back seat. 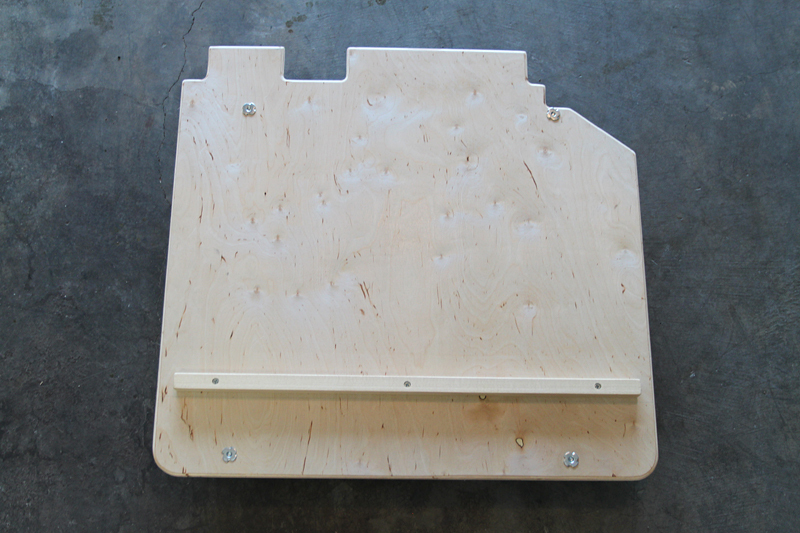 The back edge is first "wedged" under the seat, and then the plate drops down into place against the seat bottom. If you wanted it to be really secure you could fasten it to the seat bottom mounting bolts. 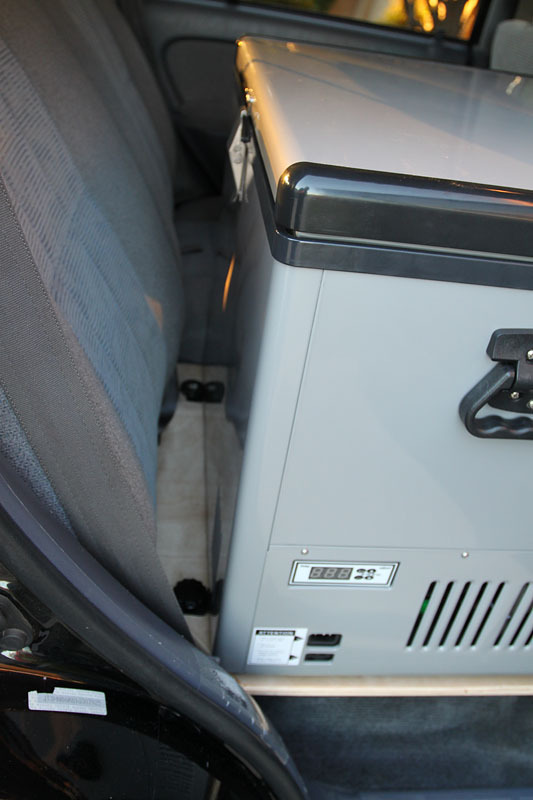 The fridge faces the rear of the truck so that the control pane is easily accesable and the vents are not obstructed. This makes it more difficult to access from the front seats, but is not a major problem. The gap allows access to install the brackets to hold the fridge in place. As mentioned above the front foot keeps the mounting plate from breaking the jack handle mounting clips. Here's the fridge mounted and ready to go. The wire is just long enough to reach the rear power outlet.